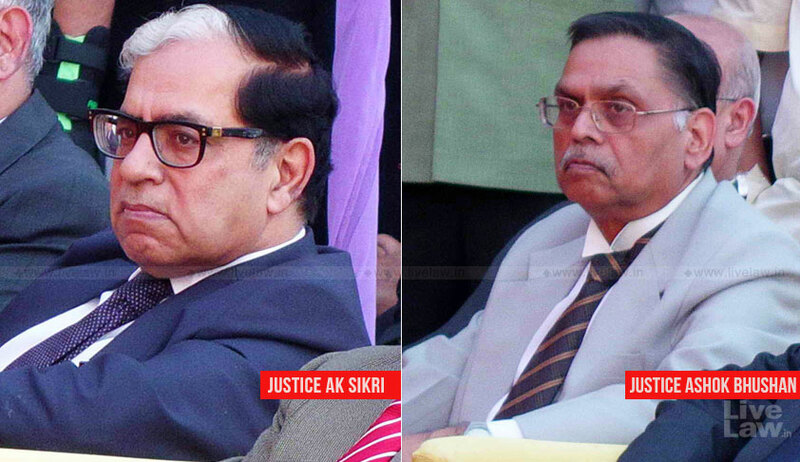 The Supreme Court bench of Justices A. K. Sikri and Ashok Bhushan on Friday issued notice to the Registrar General of the MP High court and others on the plea for reinstatement of the Former Additional District and Sessions Judge who had levelled sexual harassment allegations against the High Court judge, Justice S.K. Gangele, back in 2014. Allowing Dasti service, the bench will hear the matter after 6 weeks. Appearing on behalf of the petitioner, Senior Counsel Indira Jaising stressed on the urgency of the matter, submitting that the effective relief sought is for restoration with the due seniority. The ADJ has alleged that her resignation amounted to an act of “constructive termination”, claiming that she was in fact forced to put in her papers as a consequence of her being unlawfully and in a mala fide manner transferred to a conflict area for not bowing to the immoral demands put forth by her superior. The ADJ had alleged sexual harassment by Justice Gangele in 2014 and had filed a detailed complaint with then Chief Justice of India, R.M. Lodha, and senior judges of the Apex Court after resigning from her post. A three-member judicial committee headed by Justice Vikramajit Sen was then set up in April 2015 by Rajya Sabha Chairman Hamid Ansari to look into the allegations. Thereafter, with Justice Sen’s retirement, Justice Ranjan Gogoi was appointed as the head of the panel in February 2016. However, soon after, Justice Gogoi had recused himself from the probe, leading to the appointment of Justice R.F. Nariman as the committee’s head. After such changes, the final panel, comprising Justice R. Banumathi, Justice Manjula Chellur and Senior Advocate KK Venugopal had, in December last year, found that the charges were “not proved”, and had termed Justice Gangele’s conduct to be a part of routine district administration/ exercise of supervisory power by the high court. It had however concluded that the complainant ADJ was a good officer who fell victim to wrong impressions and that the MP High Court showed lack of human face in transferring her mid-term. Since the complainant lady judicial officer was also forced to resign after her transfer to a remote naxal-affected location at a time when her daughter was to sit for Board examination, the committee was of the view that she should be reinstated if she is interested in joining back the service. It had, however, hastened to add that giving such a direction is not within its purview.